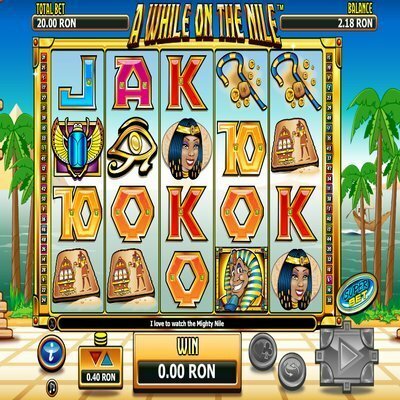 [miau] ‘A While on the Nile” is a 5 reel, 50-payline slot machine designed by Next Gen that has all the quality graphic design the company is known for with an Egyptian twist. It features familiar pharaonic symbols in a cartoon mode which come off looking quite good. The Egyptian symbols include a Pharaoh’s staff, colorful scarabs, an Egyptian Princess, the Eye of Horus, shimmering green jewels and other ancient artifacts. Rules are simple. Play is fixed at 50 lines. Payouts are made according to the pay table. Pay line wins are multiplied by the amount bet per pay line. Scatter wins are determined by the amount put up in the bet. Anything won is then added to the pay line pot. The highest win only is considered on each pay line. Wins on separate pay lines are added together and all wins take place on certain lines except with the scattered pot. All wins take place on certain lines except scattered Jewel and Scarab and all symbols pay left to right except scattered Jewel which pays any. The game includes the ‘Super Bet’ option allowing players to pay extra coins to enable a multiplier on any wins that involve the wild symbol: the Pharaoh. The player can increase the win up to ten times if an extra 300 coins are paid per spin. The Pharaohs appear stacked and can cover all of the positions on Reels two, three and four and can net some big money when Super Bet is put into play. Enabling Super Bet gives the player the choice of a win multiplier on wins with the Pharaoh. The player can pay an extra fifty coins per spin for a double multiplier, an extra hundred coins for a quadruple multiplier, an extra two hundred coins for a six-time multiplier and an extra two hundred fifty coins for an eight-time multiplier, or three hundred coins for a ten-time multiplier. Even without enabling Super Bet, the basic game is still worth playing. There are two bonus features that increase the thrill of the game. The free spins round offers 5 free spins. Symbols are turned wild on every spin. If you have Super Bet enabled from the previous round those multipliers are still considered active. The Diamond symbol appears scattered on Reels 2, 3 and 4. They trigger the free spins round and pay a two-time bet prize… This round can be re-triggered and pays out well if hit correctly. The second bonus involves picking Scarabs to win cash prizes until you see “Collect.” It takes about 300 spins to hit either of the bonuses. The Scarab appears on Reels 1, 3 and 5 and three scattered Scarabs trigger the Scarab Hunt Round. The Gamble Option allows all wins to be gambled up to 5 times. Players can pick either the correct color or suit of the next revealed card to double or quadruple the win. Coin sizes range from 1 to 50 credits. The “information” feature explains all the pay-outs and outlines the different bonuses. A While On the Nile is a well-designed game, appealing to both entertainment players and high rollers. With a little luck and the right combination of multiplier, players can expect big wins as the stacked wild symbols and extra wilds pay off in gold.